Rights for central administration workers: Light at the end of the tunnel? The European Commission should swiftly propose to transpose the recent social partner agreement on information and consultation for central administration employees into a Council Directive, writes Klaus Heeger. Klaus Heeger is Secretary General of the European Confederation of Independent Trade Unions (CESI). Just before the Christmas break, on 21 December, the component members of the EU’s sectoral social dialogue Committee on central government administrations, CESI and EPSU (for the employees) and the European Union Public Administration Employers (EUPAE; for the employers) signed a landmark social partner agreement on information and consultation rights for central administration employees. This brought months of controversial, sometimes tough, but in the end successful negotiations in the committee, to an end. This was good news just before Christmas for millions of government employees: The social partner agreement is crucial, because central government administration workers have so far been explicitly excluded from the EU’s information and consultation legislative framework. It fills a legal vacuum. The agreement will bring about concrete improvements for many central administration workers. Its conclusion also shows that, against all criticism, social dialogue does work and that employees and employers can come to cordial terms among each other on many issues. But two issues should not be forgotten about. The first, on social dialogue and worker rights more generally, is that despite the importance of social partner autonomy and successful social dialogue in many topic areas (such as information and consultation of central administration employees), experience has shown that strong EU-wide applicable legislation initiated directly by Commission proposals is needed to change the course of action of employers in numerous cases. Social dialogue cannot achieve everything. All too often they block progress towards adequate worker protection. The recently withdrawn maternity leave file and the currently negotiated women-on-boards dossier are just two examples of cases in which the employers’ lobby induced the Council to water down (women on boards) or even block (maternity leave) legislative proposals for years. Mr Juncker recently announced a whole new social pillar for the EU. If he wants Europe to become more social, if he wants all workers to be able to enjoy decent and non-discriminatory working conditions regardless of their type of contract, or the location of their place of work, then the Commission must quickly come up with proposals for binding legislation especially on substantive EU-wide standards on equal rights for posted workers and people employed in precarious conditions. The second, on the CESI/EPSU-EUPAE agreement of December 21 specifically, is that social partner agreements are only operational in those countries represented by the signatory parties. This is also the case with the agreement on central administration workers of December 21. If it is to become binding in all EU Member States, articles 154 and 155 of the TFEU rule that the European Commission is to issue a legislative proposal for a Council directive. 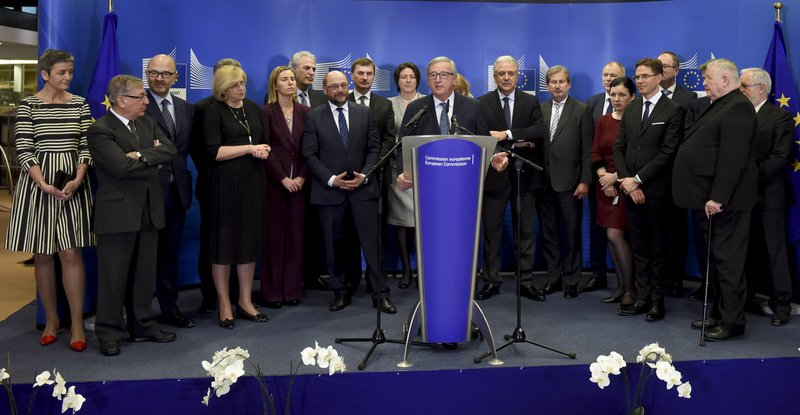 Mr Juncker announced a ‘new start’ for social dialogue at the start of his mandate. If he wants to remain credible and honour the principle of social partner autonomy and initiative, he needs to welcome the initiative of the CESI/EPSU-EUPAE and swiftly issue a proposal to transpose the agreement 1:1 into a Council directive. The infamous procrastination by the Commission with regards to proposing to transpose the 2012 social partner agreement on health and safety for hairdressers into a Council directive may not indicate the best prospects. Nevertheless, I remain hopeful that the Commission will see the benefits of giving all central administration workers in the entire EU adequate rights in matters of restructuring, work life balance, working time and occupational health and safety. One hand for the chinesation of EU competitiveness and the other for safeguarding nepotism. Great news for the screwed middle class that is united as consumers in your Europe.